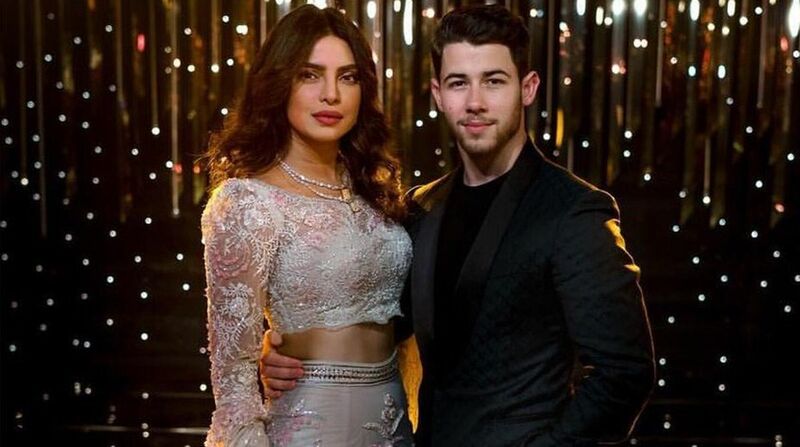 Bollywood actor Priyanka Chopra and American singer Nick Jonas hosted their wedding reception on Wednesday for media personalities in Mumbai. On Thursday, the newlyweds threw another reception at Taj Land’s End in Mumbai for their entertainment industry friends. Priyanka Chopra looked breathtaking in Abu Jani Sandeep Khosla’s light blue lehenga with heavy embroidery detailing. And to complete her look she teamed it up with matching chains and styled her hair in beachy waves. Nick opted for a black T-Shirt and royal blue blazer suit and he looked dapper. Nick and Priyanka came hand in hand and all smiles, as they posed for the shutterbugs. The pictures and videos have flooded the social media. Take a look. The American singer couldn’t keep his eyes off his gorgeous wife Priyanka Chopra. The celebration was a star-studded affair and the pictures and videos are proof that the party was an amazing one.